Coming off a heat wave, it’s hard to believe that Labor Day is this weekend. To me, Labor Day signals autumn, and autumn means sweaters, falling leaves and warmer fragrance. Comme des Garçons Blackpepper should come with “autumn” stamped on its label. Say “black pepper” to me, and I think “biting, bracing, sneezy.” Fortunately, after its initial hit, Blackpepper is none of that. Blackpepper opens with a peppery blast instantly softened by wood with a skin-like, tobacco-sweet air about it. As it settles, sometimes I catch a whiff of mild spice, like waft from a glass of absinthe across the table with a pinch of cinnamon on top. Warm musk infuses the scent but doesn’t overpower it. Before I smelled Blackpepper, I was sure it would be an assertive, spiky fragrance, like pepper itself, but it’s not.1 Blackpepper smells like a watercolor painting of black peppercorns on a wooden plank: soft, personal and almost pillowy. It’s more about wood, gentle spice and musk then it is about pepper. As Blackpepper wears, it reminds me of my driver’s ed teacher’s advice that for the smoothest stop, it’s best to ease up on the brakes just before you come to rest. This scent is no racecar. Which brings me to what might be Blackpepper’s greatest drawback — or virtue — depending on who you are. Blackpepper is a quiet fragrance. Not only that, but after a few hours, only an incense-like trace lingers. That trace, though, murmurs beautifully. A few hours after I first wore Blackpepper, I kept sniffing the air, thinking that the hippie incense I’d burned earlier was a lot better than I’d remembered. At last I realized it was Blackpepper’s ethereal dry down. If you're sampling this one, you'd do best to try an atomizer, and don't stint on sprays. Blackpepper does a great job of being both wearable and interesting. 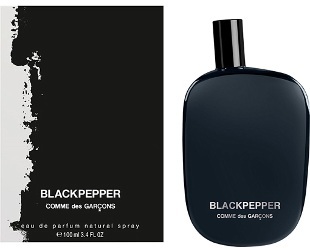 For people new to fragrance, I can see Blackpepper becoming a gateway fragrance to, say, Comme des Garçons Man 2. For those of us with a — ahem — bottle or two stashed away, Blackpepper might become something we reach for as the days shorten and a comforting, yet out-of-the-ordinary, scent is called for. By chance, Denyse at Grain de Musc is reviewing Blackpepper today, too. Her review is here. Comme des Garçons Blackpepper Eau de Parfum is not yet available in the United States. In the U.K., it’s exclusive to Selfridges and is £80 for 100 ml. Great Review Angela! I wonder how does it compare to Marc Jacobs Bang? I’ve only sampled Bang once, so I can’t tell you. Tomorrow I’ll stop by Macy’s and give it another try and will report back! But seriously, this sounds like a perfect unisex scent, something to share with your significant other. Black pepper and vanilla ice cream sounds so intriguing! Pepper is good with really juicy strawberries, too. Yes, I think Blackpepper would be a terrific shared fragrance. I’ve had fresh strawberries in a balsamic reduction, sprinkled with black pepper. Delicious. Great review…I will have to give this a sniff when I’m out and about. That sounds delicious! I wonder how it would be on plums? I have a tree out back weighed down with Italian plums. I have made a dish of this as well! Italian plums, broiled with a touch of sugar and salt, and then served with a little bit of balsamic vinegar reduction sauce,black pepper and cream. VERY GOOD. Duly noted! I see this happening in the very near future. Tried this last week and really liked it. Big blast of pepper up front, then a lightly sweet incensey drydown. That’s how it hit me, too. Plus a nice warm musk. I did notice that my dress smelled peppery the after wearing it. Can anyone compare this to LL Poivre? I think we need a 5 Pepper Fragrances You Should Try post! Yes!! I would like to read that. It seems like pink pepper was big a few years ago. I love the pepper in Nuit de Tubereuse. I’ll propose it! I don’t know enough about pepper fragrances to carry it off myself, but one of us at NST should! Is pepper in perfumery derived from one of those IFRA regulated substances? I’ve read (I think) that Caron’s Poivre is not what it used to be, for that reason. But then Poivre was apparently really fiery. Maybe it’s clove and carnation that I’m thinking of, that are now restricted. That’s a good question and one I can’t answer (except to say that pink pepper sure doesn’t seem restricted!). Caron Poivre almost certainly has clove and carnation, too. Yes — that was the clove. I own (AND LOVE, LOVE, L-O-V-E) Marc Jacobs Bang! I’ll wear it tomorrow and when you write your review i’ll happily add my impressions to the comments. If you’d allow? BTW… Again, after I Smelled Bang, I envisaged in my own mind a VERY Black Pepper forward fragrance that was kind of twisted… It was a scent of Black Pepper, Cucumber, Water Mint, Grapefruit, White Thyme, Vetiver Haitian, Pear, Sicilian Lemon, and Petitgrain with a Trace of Elemi and Artimesia (Did I spell that right? That always Confounds me on it’s spelling! LOL!) and here’s the kicker… A Heart of Orris Absolute!!! I think it’d be interesting, No? Love your reviews as always and i will be searching eBay for this CdG Scent Very Shortly! Hugz, Mon Angel Angela! Thank you for your description! I was hoping someone would weigh in who knew Bang. This is a nicely detailed description. And iris! I definitely need to smell this again. LOL! I should have used better punctuation… I was speaking of a fragrance I had envisioned in my mind… The notes have nothing to do with Bang… I just thought when you post your review, i’ll write then and we can compare impressions! The notes I described were the idea of a Fragrance I imagined and wondered what you would think about if it actually existed from those notes alone… I fear I confused you, Mon Angel! Oh! Well, in my mind’s eye it smells terrific! Simply reading the notes is so evocative. 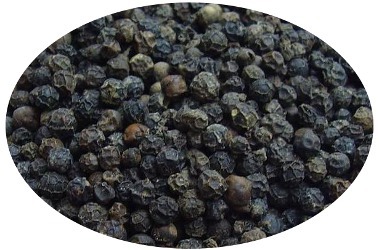 Blackpepper sounds like it gives us a gentle reminder not to judge a fragrance by its name. Watercolor scents make me happy. This one goes on my to-try list. Thank you for the thoughtful review. You’re welcome, and, you’re right, I did learn not to judge Blackpepper by my preconceptions.